The Iowa Great Lakes cover 12,700 acres with seventy miles of shoreline. Five of the lakes (East Okoboji- West Okoboji, Lower Gar – Upper Gar, and Minnewashta) are connected so boats can travel between the lakes. Boats must pass under bridges to move between the lakes with clearance that varies from five to nine feet depending on lake water level. Sailboats with their white and colorful sails provide a beautiful sight on the blue waters of the Iowa Great Lakes. Some sailors are out for the pleasure of sailing – for the enjoyment, while other sailors are out to test their racing skills. There are sixty-five sailboats in four classes registered to participate in the racing program operated by the Okoboji Yacht Club. Racing begins in early June and runs through Labor Day weekend. Okoboji races are on Saturday and Sunday morning, generally south of Manhattan Beach on West Lake Okoboji. Races begin around 10 a.m. 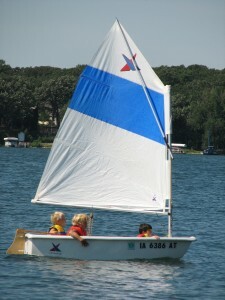 The Okoboji Yacht Club Sailing School offers lessons for all ages. Information courtesy of the Water Safety Council. For more information on boating and sailing, visit www.watersafetycouncil.org/sailing/index.html, www.oycia.org, or www.oycss.org.